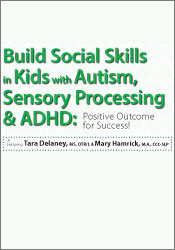 Tara Delaney, MS, OTR, is a nationally known child development expert who specializes in sensory processing, autism spectrum disorders as well as learning disabilities, specifically dyslexia. 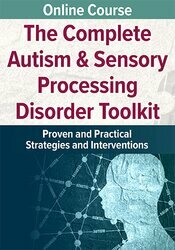 She is the author of three books: The Sensory Processing Disorder Answer Book (Sourcebooks, 2008), 101 Games and Activities for Children with Autism, Asperger’s and Sensory Processing Disorder (McGraw-Hill, 2009) and Building Social Skills for Autism, Sensory Processing Disorders and Learning Disabilities with Mary Hamrick (PESI, 2015). She holds a Master’s of Science in Therapeutic Science from the University of Wisconsin-Madison. She is an international speaker and her Making Sense-ory® programs are in high demand throughout the United States. Ms. Delaney is the co-chief executive officer of School Steps, Inc. as well as co-chief executive director of ABA In Action. She is also the founder/executive director of Baby Steps Therapy. Financial: Tara Delaney is in a leadership position with School Steps, Inc. and Baby Steps Therapy. She is an author for Sourcebook, McGraw-Hill, and PESI Publishing & Media. She receives a speaking honorarium from PESI, Inc. Non-Financial: Tara Delaney has no relevant non-financial relationship to disclose.